When you are building a customer’s new home, you pay attention to details. You want to work with subcontractors who do the same. Attention to detail matters in any building trade – it’s especially important when it comes to insulation. Poorly installed installation has a long-term impact on energy expenses and comfort, and is difficult to correct once the construction process is complete. 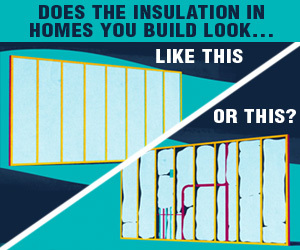 What does the insulation look like in your new homes? Is it smooth and evenly fills each cavity, or is it compressed and inconsistent? If the insulation has gaps and is compressed in areas, the impact is huge. Improperly installed insulation can increase energy costs, impact code compliance and have a negative impact on comfort. To learn more about why proper insulation installation matters, click here and view this brief video from NAIMA. If your insulator isn’t following proper installation techniques, call us to discuss your next project. Like we always say, what you don’t see makes all the difference.